Farah Saleh, 'A Fidayee son in Moscow', 2014, video and installation, in 'Suspended Accounts' at The Mosaic Rooms, London. Photo credit Kelise Franclemont. Six Palestinian artists under 30 show their work in AM Qattan Foundation’s 8th edition of the “Young Artist of the Year [YAYA]” award and exhibition at Mosaic Rooms, London. YAYA 2014 “Suspended Accounts” debuted in Ramallah in the Occupied Territories in conjunction with Qalandiya International 2014, Palestine’s biennial art festival. “Suspended Accounts” ends 27 February 2016. Bashar Khalaf, ‘Shadow of the shadow’, 2014, oil on canvas, in ‘Suspended Accounts’, Qalandiya International 2014 biennial art fair in Ramallah Municipal Hall, Palestine. Photo credit Kelise Franclemont. Since 2000, the AM Qattan Foundation based in Ramallah, Palestine/Occupied Territories has developed a biennial programme for Palestinian creative professionals living/working in Palestine or from exile. In the Young Artist of the Year Award [YAYA], makers between the ages of 22 to 30 work to develop their voices as international artists, in a project which, in 2012, became an integral part of the inaugural Qalandiya International [QI]** biennial art festival. A QI-sponsored tour of the area overlooking the ancient farming terraces of Battir, a village in Palestine/Occupied Territories still using thousands of years old agicultural methods. In 2014, Battir was certified a UNESCO World Heritage Site. Photo credit Kelise Franclemont, 11 November 2014. Majdal Nateel, ‘Without coffins’, 2014, installation, in ‘Suspended Accounts”, Qalandiya International 2014 biennial art fair in Ramallah Municipal Hall, Palestine. Photo credit Kelise Franclemont. Aya Abu Ghazaleh, ‘Refugee Camp: A place under experiment’, 2014, ink and charcoal sketches on paper, in ‘Suspended Accounts”, Qalandiya International 2014 biennial art fair in Ramallah Municipal Hall, Palestine. Photo credit Kelise Franclemont. Hanadi Azmi, ‘Drafting history’, 2014, installation and found ceramic pieces, in ‘Suspended Accounts”, Qalandiya International 2014 biennial art fair in Ramallah Municipal Hall, Palestine. Photo credit Kelise Franclemont. “Invisible Narratives“, “Self-Historicisation“, and “Imagination“. Having visited “Suspended Accounts” during Qalandiya International 2014, here was another opportunity to view the work again in Mosaic Rooms. Of course, there are often practicalities and downright impediments that could prohibit the artist and/or the full work of art coming to London. So bearing that in mind, would these evocative and thought-provoking works “travel”? Would they be as strong in London as they were in Ramallah when here, they are outside of the vital context of their making? Farah Saleh’s installation/video work, “A Fidayee son in Moscow” is “a self-historisation and re-appropriation” of the history of the artist’s brother, who attended a school for “children of revolutionary parents” in Moscow the 70s. Saleh creates an interactive installation where viewers can join the video teacher’s choreographed movements, leave a note on the paper atop the desks, or observe from the background. For Saleh, this piece is “…more than a form of nostalgia for a certain era, and if so, it would be a nostalgia that is prospective, which reflects on the past and present of the children of the left of a certain generation, while questioning [their] future“. The video first captures the attention, and I simply watch without participation; as with the notes from anonymous writers – I read them but do not add my own words. Even though I am somewhat an outsider here; all the same, I feel welcome to watch, listen, and learn. Farah Saleh, ‘A Fidayee son in Moscow’, 2014, video and installation, in ‘Suspended Accounts’ at The Mosaic Rooms, London. Photo credit Kelise Franclemont. Farah Saleh, ‘A Fidayee son in Moscow’, 2014, video and installation, in ‘Suspended Accounts’, Qalandiya International 2014 biennial art fair in Ramallah Municipal Hall, Palestine. Photo credit Kelise Franclemont. At QI 2014, Hamody Gannam’s “Wadi Nisnas” is a walk-through installation of curious stacks of file boxes, from which, as the viewer approaches, s/he must pause for long minutes to try and make out the voices or street sounds. By the work’s title, I presume these were recorded from the central Palestinian/Arab neighbourhood of Wadi Nisnas in Haifa, a coastal city of Israel. In Mosaic Rooms, it seems constraints on space and sound trims the work to about 1/3 its size, with the cartons stacked against one wall, and the addition of headphones poking out here and there. Though not as immersive or mysterious as it was before, by itself in a cellar-type room, leaning in closely enough, one could still get a sense of eavesdropping (or maybe wire-tap?) vibe I think Gannam was going for – and it still worked. Hamody Gannam, ‘Wadi Nisnas’, 2014, mixed media installation and sound, in ‘Suspended Accounts’, Qalandiya International 2014 biennial art fair in Ramallah Municipal Hall, Palestine. Photo credit Kelise Franclemont. “Re-repeat” by Iman al-Sayed is a poignant collection of drawings mined from the artist’s father’s memories and personal archives of papers, stories, and photographs. Having these physical records allowed al-Sayed “to re-repeat her father’s memories [and] somehow granted her the eligibility to be in Palestine through … the narratives given. The archive helped her be in a space that she is not allowed to physically exist in.” In QI, it was a bit easier to be enveloped in this piece as a whole experience and feeling a bit ensnared by the artist’s (?) eyes on the ceiling keeping watch. Yet in Mosaic Rooms, the visitor has the opportunity to spend more time on the individual drawings themselves in a more contemplative manner, exquisite little moments I might otherwise have missed out on again if there were giant eyes peering down at me. Iman al-Sayed, ‘Re-repeat’ (detail), 2014, mixed media installation, in ‘Suspended Accounts’ at The Mosaic Rooms, London. Photo credit Kelise Franclemont. Iman al-Sayed, ‘Re-repeat’, 2014, mixed media installation, in ‘Suspended Accounts”, Qalandiya International 2014 biennial art fair in Ramallah Municipal Hall, Palestine. Photo credit Kelise Franclemont. “Shadow of the Shadow” is the witty series of paintings by Bashar Khalaf (header image) that refer to the work of Suleiman Mansour, a renowned Palestinian painter especially important in pre/post Intifada years. For Khalaf, these images “...transfer the content [of Mansour’s paintings] as a message to remind us of the identity, the place and the nature of our lives as Palestinians… as well as form a continuity of the principles and vision of the artist Suleiman Mansour even if the methods used are different.” Even if one had never heard of Mansour, what hits the mark is the wry commentary on a young Palestinian’s life – under constant surveillance, thinly veiled by tradition, or merely existing in the shadows. In this installation, a short video opens with a single photograph of a group of Palestinian artists, and steps through Abu Arafeh’s research to find out: who are these men? and focusing on one of them, deceased years previous, is the narrator of the story. The viewer is asked to “question the truth-teller/truth-telling as an activity and its relation to writing the history, examining the borders between truth and the act of writing history/storytelling as the truth.” Having watched this film more than once, the truth becomes no more evident than on the first viewing – which I supposed is the point, and a quite effective one. Noor Abu Arafeh, ‘Observational desire on a memory that remains’, 2014, mixed media installation, in ‘Suspended Accounts’, Qalandiya International 2014 biennial art fair in Ramallah Municipal Hall, Palestine. Photo credit Kelise Franclemont. Noor Abed’s film, “Penelope” of a woman sewing a fish net (as in made of fish, not a net for fish) refers to “…the concept of myth, its position in history and relation to the present and the imaginary.” As she endlessly threads the sardines together, the seamstress is seen as the grieving wife of Odysseus, who while the explorer is lost at sea, Penelope cleverly avoids unwanted suitors with a trick: forced to weave a burial shroud for her presumed-dead husband, she unpicks the garment every night and starts over in the day. Noor Abed, ‘Penelope’, 2014, video installation, in ‘Suspended Accounts’ at The Mosaic Rooms, London. Photo credit Kelise Franclemont. Myth enters history from a different perspective; reflecting a reality other than the one history offers. If you missed the richly engaging and astute works by these up-and-coming Palestinian artists on their home turf, don’t miss them now at Mosaic Rooms. Yes, it may take a little time with the works to really let them in but so worth the effort. These young makers share their ideas and experience with potent maturity, consummate skill, and pulling no punches. And as you walk away, there will be plenty to think about. 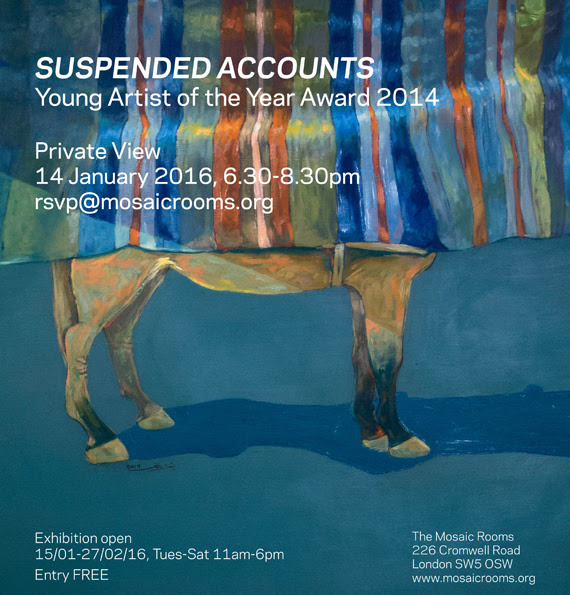 Visit “Suspended Accounts” at Mosaic Rooms, London – ends 27 February 2015. Exhibition details: “Suspended Accounts” is on at Mosaic Rooms, AM Qattan Foundation, Tower House, 226 Cromwell Road, Earls Court, SW5 0SW. Free admission, step-free access. Hours: Tuesday through Saturday, 11:00 to 6:00PM. ** QI is a biennial art festival that offers exhibitions, performances, talks, and educational events all over historic Palestine, and takes its name from one of the more contentious checkpoints between Ramallah and Jerusalem which drastically impedes movement of people between these two areas. It is these checkpoints and other discrimination that make QI difficult for both locals and foreign visitors to enjoy, as both must cross the Separation Barrier to get between Israel and Palestine, if they can – which is kind of the overall point of this festival. But I digress; you can read more about Qalandiya International 2014 here.